In the Master Collection, you'll find the finest timepieces made by the Swiss watch manufacturer Longines. Highlights in this series feature four retrograde displays or combine a chronograph with a calendar and moon phase display. The Longines Master Collection features exclusively mechanical watches. Most of the watches in this series have an automatic movement, but some hand-wound watches are also available. 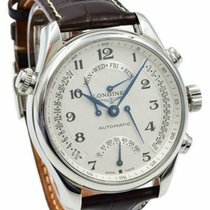 The Swiss watch manufacturer Longines introduced the series to the market in 2005. The Master Collection pays homage to the company's top achievements and successes, showcasing the pinnacle of this manufacturer's art. The series includes chronographs with a calendar and moon phase display as well as models with four retrograde displays, in which the hand jumps back upon reaching the end of the display. These watches with complications display a second time zone in addition to the date, day, and moon phase, as well as featuring a day/night indicator. Alternatively, there are also streamlined automatic watches with a date or day/date display. This series also offers diamond watches for women. Longines has been making innovations and setting records since the company was founded in 1832. This includes the world's first quartz watches, which were already reaching peak precision levels in the mid-1950s. For this and other reasons, the Saint-Imier-based manufacturer remains the official timekeeper of various sports to this day. In particular, the company has close ties with equestrian sports. The Equestrian series is dedicated to this field and features design elements reminiscent of stirrups and horseshoes. How much do Master Collection watches cost? 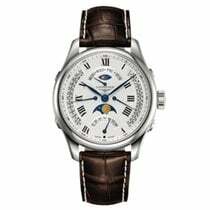 The Longines Master Collection timepieces offer very good value for your money. Simple automatic models with three hands and a date display can be found in mint condition starting around 1,400 euros. You can get pre-owned chronographs in very good condition for around 1,200 euros. Like-new models with a timing function go for around 1,800 euros. A Master Collection watch with a GMT function, which displays a second time zone, costs around 1,700 euros with no signs of wear. For around 2,500 euros, you can find mint condition watches with a calendar, moon phase, and 24-hour display. 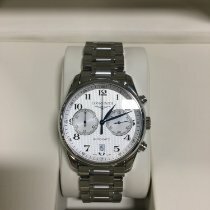 The price goes down by about 1,000 euros for used watches. Never worn models with four retrograde displays start at 2,500 euros. All in all, the Master Collection gives you a lot of quality craftsmanship for your investment. 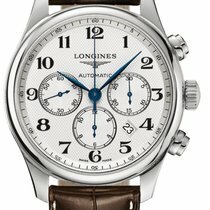 Which complications do the automatic watches of the Longines Master Collection have? The chronographs with a calendar and moon phase indicator are among the highlights of the Master Collection series. These watches come in stainless steel or 18k rose gold. The latter versions have a brown alligator leather strap with push-pieces and triple fold-over safety clasp. With the stainless steel models, you have the choice between an alligator leather strap or a three-link stainless steel bracelet. The timepieces have an overall sporty, elegant design. Models with a leather strap have Arabic numeral hour markers on silver-toned dials. On the stainless steel bracelet versions, Roman numerals display the time against a black dial. Every model displays the date with a long hand featuring a half-moon shape at its tip. You can read the current day and month below 12 o'clock; both indicators are located in the chronograph's 30-minute counter. The 12-hour counter and the moon phase indicator are positioned at six o'clock. At nine o'clock, you'll find the small seconds dial and the 24-hour display. Caliber L678, which is based on ETA's Valjoux 7751, is responsible for these diverse features. Thanks to its automatic movement, the watch winds itself while its worn, so there's no need for manual winding. When the movement is fully wound, the power reserve lasts for 48 hours. Retrograde displays are rather rare on wristwatches and therefore quite special. These watches have hands which jump back to the starting position upon reaching the end of their display. Some models in the Master Collection have four retrograde displays for date, day of the week, small seconds, and 24-hour dual time. These watches show the day of the week and the day/night display at 12 o'clock. The subsidiary seconds dial is positioned at six o'clock, and the moon phase indicator lies above it. The 24-hour and date display are found at the left or right edge of the dial. If the timepiece has an incorrect display, you can easily correct it using the four push-buttons on the side of the case. The stainless steel watch comes with a silver-colored or black dial. Both versions have Roman numeral hour markers. Scratch-resistant sapphire crystal offers the dials optimal protection against damage, and when you turn the case around, you can admire the movement through its sapphire crystal caseback. You have the choice between a three-link stainless steel bracelet or an alligator leather strap. A triple fold-over clasp with two push-pieces guarantees a secure fit on your wrist. All of the women's watches in Longines' Master Collection come with automatic movements, and that is no small matter. Many manufacturers use precise, battery-powered quartz movements for their small and slim women's models. The smallest timepieces in the Master Collection are especially compact with a diameter of only 25.5 mm. These watches look best on narrow, feminine wrists and are the ideal accessory to be worn with a ball gown, for example. The 18k rose gold models with a diamond bezel and mother-of-pearl dial are particularly elegant and feminine. Because the trend is moving towards larger watches, Longines also offers larger watches for women. They are up to 38.5 mm in diameter and could therefore also be worn by men. Diamond indices decorate some of these stainless steel and gold bicolor timepieces . The day/date or date display of the basic three-hand watches are particularly practical. You can buy a mint condition bicolor model with diamond indices and a day and date display for around 2,500 euros.